New improved MkII version of Pro-Ject's popular VCS cleaning machine with fast, quiet motor and high suction power allowing for quick cleaning. Earn 309 loyalty points when you order this item. Pro-Ject VCS Vinyl Cleaning System Machine MkII has its foundation, the builds on Pro-Ject's first Record Cleaning Machine, the VCS which achieved international success. The MkII keep elements of the original design, with improvements to the arm, the motor, the clamp and the chassis to further improve the unit's performance and its ease of use. With the same special vacuum technology as the first model, which enables a records side to be dry, in two rotations. Plus, the motor has been changed to a new low-noise type that still manages to deliver the torque and speed required. The new motor is still capable of dual-directional rotation, for deeper cleaning of the record groove. The chassis now has a sleeker more professional look with printed labels while the new long-life brush with plastic handle gets deep into the record groove for optimal cleaning performance. The clamp has been redesigned, constructed from stainless steel, it ensures reliable affixing to the platter spindle, with the rubber layer on the inside of the clamp ensures your record labels are kept safe and dry. Also, the plastic flange has been improved with additional sealing which ensures the vacuum arm moves smoothly, and vacuum suction is as strong as possible. 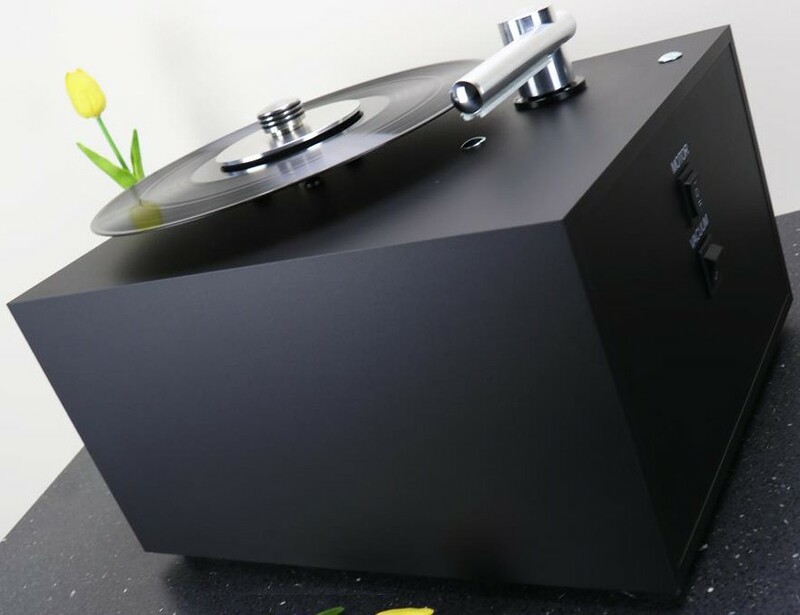 Everytime you play a vinyl, you expose them to dust and impurities from the air, that consequently builds up over time, becoming dirt within the record grooves which is not only detrimental to a cartridge’s lifespan but also the overall sound performance of a vinyl hi-fi system. 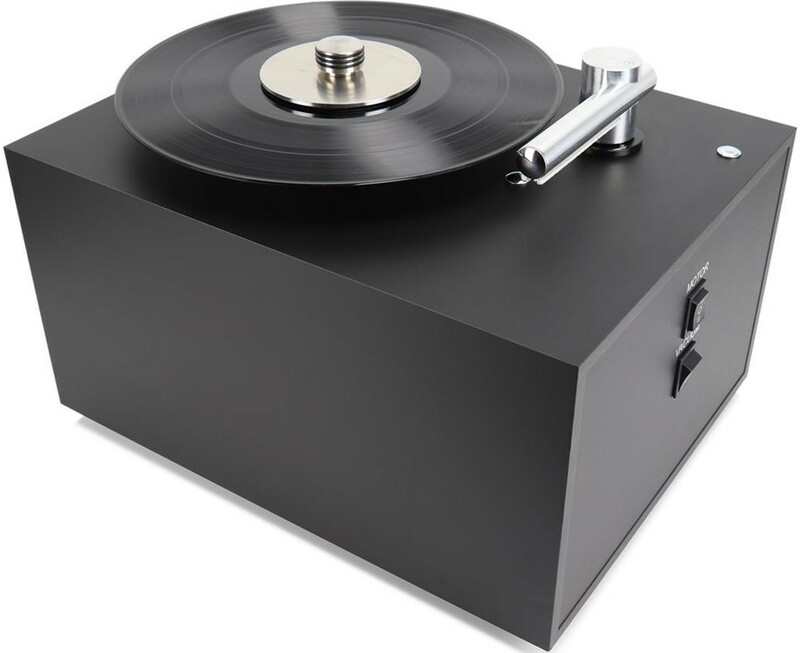 The VCS MK II works by removing impurities on a vinyl record in an efficient, quick, and cost-effective manner that extends your records lifespan. 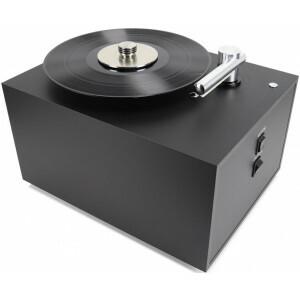 The VCS MK clamp does away with the need for a platter, which itself brings dirt into contact with a vinyl record surface. The vacuum arm is stable and robust without spring mechanisms. Operating the record cleaner is effortlessly simple. The user first applies a little cleaning fluid to the surface of the record surface with the supplied applicator bottle, and then engage the new, quiet motor spinning. Using the supplied goats’ hairbrush, it effectively spreads the fluid over the surface of the record, the user can also change the direction of the motor to ensure the full groove has cleaning fluid. Position the arm correctly and engage the vacuum, and within a few rotations, the side of the record side will be clean, dry, and ready for playing as if it were new. The cleaning process ends with the accumulated used solution mix being sucked by the vacuum and filtered away from the machine's electronics and stored in a large waste container (2.5 litres). There is a level gauge for the waste fluid on the side of the VC-S which shows when the tank is nearly full. Furthermore, emptying the waste liquid is a simple process with the supplied funnel. Plus, the VC-S MK II is supplied with Pro-Ject’s improved cleaning solution, Wash-IT. Wash-IT is perfect for cleaning vinyl since it does not contain any alcohol, it is only high-purity components which are 100% eco-friendly, non-toxic and non-flammable. The Wash-IT fluid has been specifically designed to evaporate without residue on the surface of the record after drying. Wash-IT is very efficient, 1 litre of solution can clean up to 1,500 records, once it has been diluted with either distilled or demineralised water. The MkII comes with many accessories, such as a 7” record cleaning kit, an optional dust cover. The Wash-IT cleaning solution comes in various sizes, sold separately.